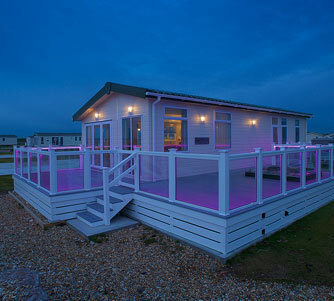 By adding our amazing decking lights, the enjoyment of your holiday home sundeck doesn’t need to stop when the sun goes down. When considering lighting for decking, ask our sales team for the options available, and be inspired to add a glow to your deck. This can make all the difference when entertaining or using your deck in the evenings, as well as looking amazing. Good decking lighting is about complementing your Sundeck and enhancing features such as balustrades, hot tubs and dining areas. 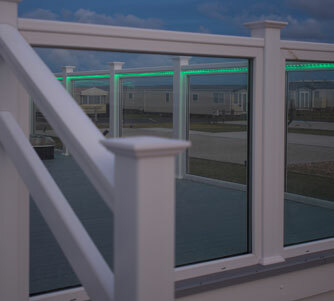 Our integrated LED handrail is revolutionary and offers the ultimate in outdoor lighting for holiday home decking. 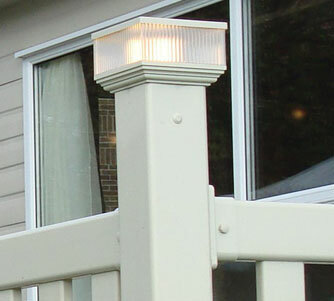 Cleverly concealed in our handrail, once lit the LED strip will give your sundeck a glamorous and almost magical look. The LED decking light strip we supply is the best money can buy and boasts great features such as being energy efficient, waterproof, robust and even comes backed with a seven-year warranty. If you want amazing decking lighting which will enhance your Sundeck and have the ‘wow’ factor the LED handrail is the one for you. Click here for an in-depth technical review on our LED Lighting. With our complete range of decking, we offer the Windsor light – a simple and contemporary accessory designed to give a modern touch and add creative decking post lights to any deck. 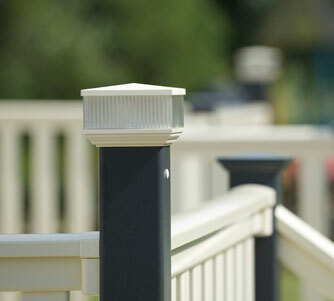 It can be fitted to any post and is offered in a range of colours to suit your choice of rail. Supplied and fitted with low-energy bulbs, the Windsor light is both affordable and attractive.